Hope's Cafe: Tervis Tumblers Are Awesome! How many of you are familiar with Tervis Tumblers? Probably just about everybody, right? There's a reason for that, you know. Tervis Tumblers are just amazing! I got my first Tervis Tumblers about 4 years ago, and they have been a favorite ever since. I love the design, the ability to choose from a wide variety of sizes, styles and designs, and the durability. After constant use for almost 4 years, my Tervis Tumblers still look like they were just pulled out of the box. That's why I was so thrilled when given the opportunity to choose a Tervis Tumbler for review. After some deliberating and more than a couple times of back-and-forth over which design, I settled on the Sweet Tea Tumbler, in the 24 ounce size. When my new cup arrived, I was very excited. 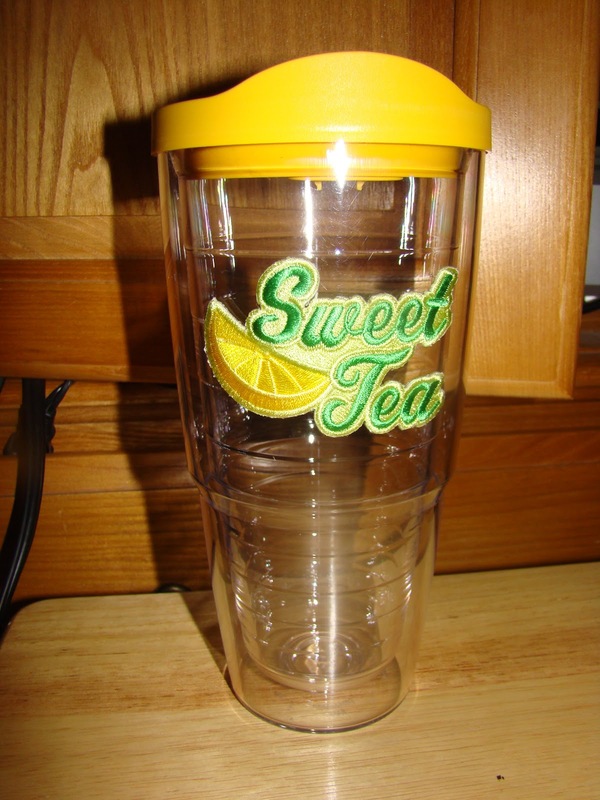 The Tumbler features a lemon wedge with "Sweet Tea", and also came with a lid. This makes it great for road trips, to bring along an ice cold glass (or rather Tumbler) of Southern Sweet Tea! I don't have to worry about the cup breaking, because I know from experience just how sturdy Tervis Tumblers are! And, with the classic Tervis double-wall, my drink stays colder longer. Of course, with winter coming on, I think I may be drinking some hot tea (still sweet though :) and the Tervis Tumbler will be perfect for that as well. Want to guess what I'm drinking?! Check out Tervis Tumblers for yourself-they are the perfect finishing touch to your dinner table. They also make great gifts for the holidays, which are just around the corner! Disclaimer: I was not monetarily compensated in any way for this review; I did receive product for the purpose of review. All thoughts and opinions are mine; all quotes taken from the Tervis website. I was not required to post favorably about the product or company. Did anyone win the Nunaat giveaway?